ARC (Asbestos Removal Contractors), the asbestos division of David Jameson Roofing, have been operating since 1998. With over 15 years experience in the asbestos removal industry we offer a specialist service and expert advice. ARC is a efficient, established environment agency registered asbestos removal company serving Northern Ireland, Ireland and the rest of the UK. All of our operatives are fully certified in all aspects of asbestos services, complying with all regulations which are very carefully managed and monitored. Training is undertaken on a continual basis in line with health and safety requirements to ensure that the highest technical standards are maintained. We also recognise that environmental awareness and legislative-consciousness are paramount in the removal and disposal of asbestos. By ensuring strict compliance with current legislation, site personnel and the general public are safeguarded through safe site storage and the secure movement and removal of waste. This effectively enables us to protect our clients from the legal implications when dealing with asbestos. Working to the conditions & regulations set by HSENI (Health & Safety Executive Northern Ireland) we provide a comprehensive skilled service in the control and removal of health hazardous asbestos in all types of buildings. All our clients can expect professional on-site evaluation and advice by properly equipped and highly trained personnel. We can provide a full analytical consultation report and costings for any project, large or small in both the public and private sector. All Asbestos Removal Contracts are conducted within the terms, conditions and advice of HSENI, assuring clients of a proper and safe completion; with the removal of solid and dust asbestos. For more information see our contact details below. At David Jameson Roofing Service Asbestos Division we know how confusing it can be to understand the new regulation regarding asbestos, selecting a competent surveying organization, creating a management report and if necessary selecting a competent asbestos removal contractor. This is why we have developed our 5 step plan to solve this dilemma for our clients. At David Jameson Roofing Service Asbestos Division we are fully qualified and insured to conduct Management, Refurbishment & Demolition Surveys. We have a trained asbestos surveying team (P402 Qualified) and management team (P405 Qualified), which are dedicated to ensuring the client, receives a detailed report showing any asbestos detected. We provide a professional and discreet service. After we have conducted the survey on your premises we then create a detailed report, which you will receive not only a hard copy but also on CD-Rom. Each report has details of how the survey was conducted, when it was conducted, the areas surveyed, and samples taken for analysis, it also includes the asbestos identification form from the UKAS Accredited Laboratory and a section on what recommendations should be taken. Our CD-Rom has proven a big hit with organizations as it allows them to store and transfer the information to all relevant parties. This is a key tool to insure that the management of asbestos is enforced on your premises. With your Asbestos Survey Report you will also receive an Asbestos Register. This register shows you each room in the building and the asbestos content, which is in each room. It shows the type of asbestos, the quantity of it and the risk posed from it. Attached with the register are digital photographs of the areas sampled. After you have received your asbestos register you then have to create an Asbestos Management Plan detailing how and when you are going to manage the asbestos e.g. remove the asbestos, encapsulate the asbestos etc. However, don’t let this daunt you as at David Jameson Roofing Service Asbestos Division we will create an Asbestos Management Plan with you to ensure that you are selecting the correct methods of treatment and that the areas are prioritized correctly. This Asbestos Management Plan looks at what actions can be introduced to limit the exposure of asbestos. It gives information how it affects you, options for management to use to control the risk from asbestos including flow charts to show what to do in emergencies, etc. After you have completed the above 4 steps you will then have the knowledge and confidence to use the correct methods to manage your asbestos. You will have a number of options available to use, for example, you can remove the asbestos, which will leave that area completely free from asbestos, which solves the problem. If this does not suit due to cost, time restraints then you can treat or encapsulate the asbestos to make it safe – however, this is a short term solution as after time the asbestos will have to be removed if it is continually being disturbed. 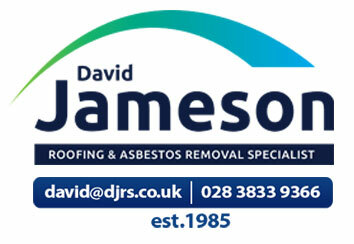 At David Jameson Roofing Service Asbestos Division we are fully insured and Licensed by the HSE (NI) to treat and handle asbestos. We also have our waste handling license that allows us to transport waste to the EU selected asbestos landfill dumps. Leaving the client with the complete asbestos package. The above list is not an exhaustive list of asbestos materials within a building and it is highly recommended to have an asbestos survey carried out should you wish to locate any potential asbestos containing materials within your home.